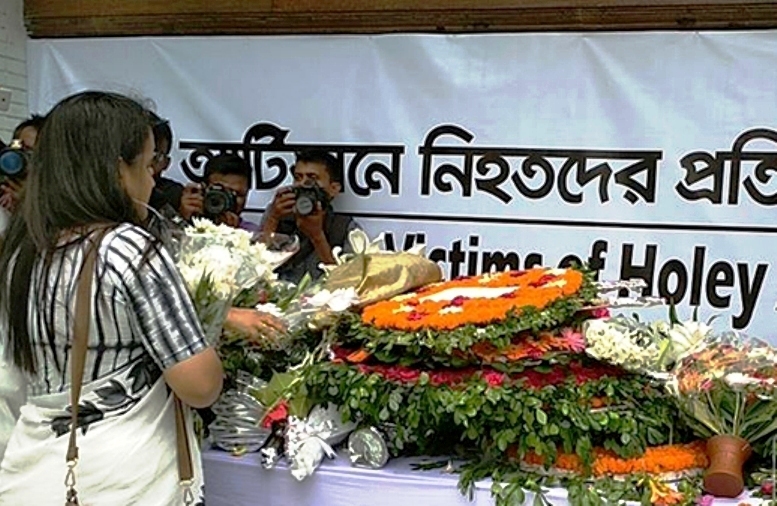 United News of Bangladesh :: People from all walks of life, including Bangladesh’s foreign friends, on Saturday paid their deep respect to those who lost their lives in the Gulshan Holey Artisan Café terror attack. Representatives from various political parties and foreign and diplomatic missions, civil society members, cultural activists and police personnel paid their respect to the café attack victims at the site of the Gulshan carnage that remained open for four hours from 10am to 2pm for all. Awami League general secretary Obaidul Quader, BNP senior joint secretary general Ruhul Kabir Rizvi, Japanese Ambassador to Bangladesh Masato Watanabe, Italian Ambassador to Dhaka Mario Palma, Counter Terrorism and Transnational Crime Unit Chief Monirul Islam, eminent writer and journalist Shahriar Kabir, among others, paid their homage to the victims of the terror attack in the morning. 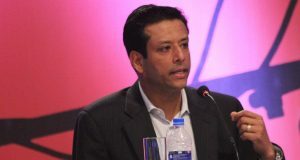 “Today is a black chapter for the country as so many locals and foreigners were brutally killed by extremists on this day,” said BNP senior joint secretary general Ruhul Kabir Rizvi after paying homage to the memories of those killed in the gruesome militant attack on Gulshan Holy Artisan Café. Additional IGP (Admin, Police HQ) Mokhlesur Rahman said the government is working to wipe out militancy from Bangladesh as efforts are on across the globe to stop IS activities. President of Ekatturer Ghatak Dalal Nirmul Committee Shahriar Kabir said Bangladesh government has been successful in combating militancy but many things need to be done to uproot their base. “We need to remember that the militants aren’t ordinary criminals, not even ordinary terrorists,” he said adding that they are influenced by Jamaat and Moududi’s philosophy. The first anniversary of Gulshan Holey Artisan Café attack, the deadliest militant attack in Bangladesh’s history, is being observed in solemn remembrance of those who lost their lives. On the evening of July 1, 2016, five militants entered the Holey Artisan Café and Bakery with crude bombs, machetes, pistols, and took several dozen people hostages, including 18 foreigners. Twenty hostages — nine Italians, seven Japanese, one Indian, one Bangladesh-born American and two Bangladeshis — were killed as the militants sprayed them with bullets indiscriminately or cut their throats to confirm their death inside the café. Besides, two senior police officers — Banani Police Station then officer-in-charge Salauddin Ahmed Khan and Detective Branch assistant commissioner Robiul Islam — were shot dead when police tried to gain control of the bakery. Thirteen people, including three foreigners, were rescued while 20 bodies of the hostages were recovered from the restaurant after a successful operation led by the 1st Para-commando Battalion, an elite force in the Bangladesh Army the following morning (July 2). Five militants and one restaurant staff were killed and one suspected militant was arrested during the drive. A case was filed with Gulshan Police Station in connection with the worst terror attack. 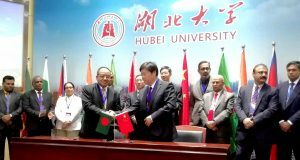 Later, the case was transferred to the Detective Branch of Dhaka Metropolitan Police (DMP). CTTC inspector Humayun Ahmed has been investigating the case as its investigation officer (IO).